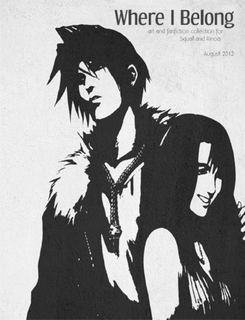 Last year there was a call to the Final Fantasy VIII fanfiction community to return to the fandom and pay homage to our celebrated couple, Squall and Rinoa. Spearheaded by Ashbear, Summoner Luna, and Niqsta (I think), the Where I Belong [Fanfiction] Challenge was born, which invited former, present, and newbie fans to contribute a story on our favorite FFVIII pair. Starting from Squall’s birthday in August, the challenge lasted up to December 2012. After the long wait, the very dedicated member Summoner Luna has finished compiling all the fanfiction entries for the book release! Yes, you read it right. A book. It is a paperback book with 542 pages worth of creative Squall and Rinoa fanfictions contributed by Final Fantasy fans from all over the world. Amazing fandom, isn’t it? To think that FFVIII has been released in 1999, and look at how the fans still manage to find the time to pay tribute once in a while to the fandom that first brought us together and inspired our childhood. What I realized after this project is that even if you have outgrown a fandom, as long as the community members are dedicated and united, you will find yourself going back no matter how long it has been. The fanfiction book is worth $14.24.